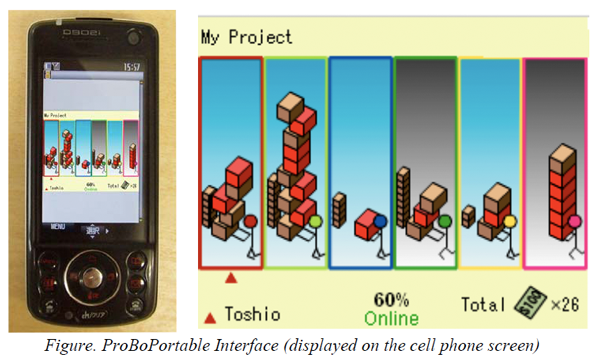 ProBoPortable is a cellular phone application which displays information regarding progress and achievement of the tasks and division of labor in project-based learning (PBL) in higher education. The ProBoPortable application works as wallpaper on the learner’s cellular phone screen, and cooperates with a Web-based groupware. When a learner activates his/her phone, ProBoPortable immediately retrieves the current status of the project from the groupware database and displays the status on the screen. ProBoPortable displays all the learners working on the project as warehouse keepers. It also displays the current status of progress of each member, the tasks allocated to each member, the tasks each member has completed, any backlogged tasks, and the overall progress of the project – this is indicated by a dollar amount on the display. The project “income” increases with the completion of each task. As a learner progresses on a task, the corresponding box slightly shifts to the left. When the task is completed the box moves to a different stack. The boxes are color coded so that the learner can instantly identify the areas of the project that need urgent attention. When a task reaches its deadline, the color of the corresponding box changes to red. In addition, the background color of each “warehouse” reflects which learners are not accessing or updating their sections of the main project Web site. Thus, the learners are expected to keep track of other members’ status on a daily basis, perform their tasks, and reorganize their division of labor as and when required. Classroom evaluation was performed in an undergraduate course, which confirmed that ProBoPortable enhanced mutual awareness of the division of labor among learners, who modified their own tasks by monitoring the overall status of the PBL. The sense of learning community was increasingly generated by using ProBoPortable. Moreover, social facilitation encouraged the learners to proceed with their own task due to the presence of others who are mutually aware of each member’s status. The ProBoPortable project received the ED-MEDIA2008 Outstanding Paper Award. This research was supported by Grant-in-Aids for Young Scientists (B) (Subject No. 17700607 & 19700630, representative: Toshio Mochizuki; Subject No. 20700652, representative Kazaru Yaegashi), and Grant-in-Aid for Scientific Research (B) (Subject No. 19300290, representative: Hiroshi Kato) from the Japanese Ministry of Education, Culture, Sports, Science and Technology.